Chandra Kala is tired. The holidays are over. 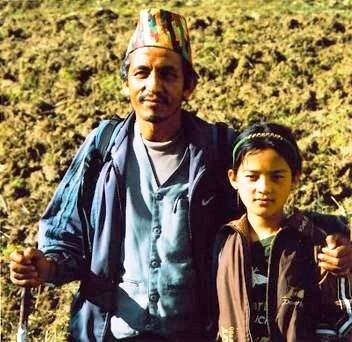 Her father who earns his living as a porter has accompanied his eldest daughter back to school. To arrive, it takes them more than three days on foot. One of our boys who wanted to save his precious shoes grazed his feet so badly that they got infected so that we had to take him to Phaplu Hospital. Many of our children have to walk for upto five, six days to visit their families or on returning to school. The two sisters from Phortse village at an altitude of more than 4000 meters, right below the slopes of Mount Everest, have the longest way to go. They have joined us in 1999. At the beginning they were suffering from home sickness, but now they rather stay with a friend near Phugmoche than going home. Their parents are extremely poor, they have no land and are hardly respected in the village. Balbahadur's home is far away. In April he will complete class seven in Phugmoche. In his village, there is no school where he could receive the School Leaving Certificate after class ten. We shall have to find a family in Junbesi for him where he might stay as a paying guest. Our former student, Chyoti, lives in her friend's family. Chyogal stays with his friend Tsering Dorje. For both of the children we pay a limited amount for footing and lodging. This year it will be more difficult: not only for Balbahadur will a family be needed, Nyima Lhamu as well is going to complete her studies in Phugmoche. She is the eldest of the two Phortse sisters. Possibly Sonam Dolkar, the girl who received the heart operation, should not daily walk the long way to Junbesi and back home. In this case we may find some helpful relatives. Chepal's and Lhakpa's parents are planning to leave Pangkarma in order to settle farther south in the valley. But the brothers should be allowed to complete their school in Junbesi. Two of our carpenter's daughters, Sonam and Doma, are studying in class seven. Their family home is too small to put the two girls up. Their widowed father has re-married. He has two children with his second wife. We have decided to take care of our needy children until they receive the School Leaving Certificate. Luckily most of our students are able to live in their parent's house. For teenagers it is not difficult to walk to school for one hour.